Bengaluru: A little over a month after Vishal Sikka stepped down as chief executive of Infosys Ltd, another of his key lieutenants who had followed him from German software giant SAP SE to India’s second largest software services firm has resigned. 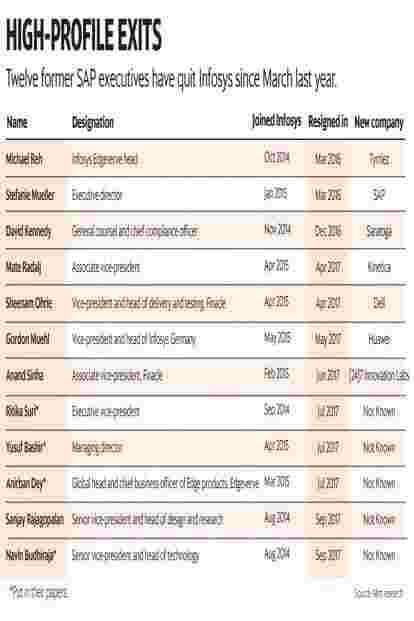 According to three people directly familiar with the development, architecture and technology head Navin Budhiraja put in his papers over the weekend—making him at least the 12th former SAP executive to have left Infosys since March last year. A senior vice-president, Budhiraja joined Infosys in August 2014, and was one of at least 16 executives from SAP to join Infosys at the rank of associate vice-president and above. His exit is easily the most high-profile executive departure since another key Sikka lieutenant and confidante, Ritika Suri, resigned in July. Earlier in September, Sanjay Rajagopalan, who had also joined Infosys from SAP in August 2014, also put in his papers. According to the people mentioned above, Budhiraja’s exit does not come as a complete surprise, given that a number of Sikka loyalists inside Infosys were expected to resign. In the days following Sikka’s decision to step down, a number of top information technology analysts, including Phil Fersht of HfS Research, the outsourcing-research company, had warned of exits of former SAP executives at Infosys. To his credit, Budhiraja, who joined Infosys with a reputation of being a world-class technologist, leaves with that reputation more or less intact, given his work and involvement with several key Infosys projects, such as the company’s Rs1,380-crore outsourcing contract with the government’s Goods and Services Tax Network (GSTN) initiative. Infosys declined to comment on Budhiraja’s exit. “We do not comment on exits or appointments other than those of key management personnel," said an Infosys spokesperson. Prior to his exit, Budhiraja was also head of the company’s education, training and assessment (ETA) division. Mint learns that Infosys has tasked company veteran Srikantan Moorthy with heading the ETA unit, following Budhiraja’s exit. Infosys, like other IT outsourcing firms, is currently in the midst of a generational transformation, as it looks to retrain hundreds of thousands of its programmers and coders on a number of new-age technologies. Budhiraja, along with Sikka’s mentor and legendary computer science professor Alan Kay, devised a new learning module for new hires made by Infosys and also additional courses in areas such as artificial intelligence and machine learning. As head of technology and architecture, Budhiraja, along with other senior executives, helped Infosys undertake complicated technology projects. Budhiraja’s exit could also impact Infosys’s ambitious plans to monetize and scale up business from its artificial intelligence-powered platform, Infosys Nia, which was the brainchild of Budhiraja and another former SAP colleague at Infosys, Abdul Razack. Bengaluru-based Infosys, now under the stewardship of co-founder and non-executive chairman Nandan Nilekani, will have to quickly replace Budhiraja on those projects and initiatives, even as the company looks to regroup from the board-level turmoil that resulted in the departures of Sikka and former chairman R. Seshasayee. Sikka’s exit was preceded by a high-profile and public spat between Infosys founder N.R. Narayana Murthy and the company’s previous board led by Seshasayee. In August, the war of words between those two parties escalated when Murthy wrote a letter to some of his closest advisers, claiming that at least three board members had complained to him about Sikka’s performance as chief executive officer—a development that Mint had first reported on 18 August. On 18 August, Sikka resigned, and the board issued a scathing six-page statement that blamed Murthy for the CEO’s decision to step down. The statement spooked the markets and wiped out nearly $4 billion of Infosys’s market value, which, in turn, prompted a massive overhaul of Infosys’s board, resulting in the departure of four board members, while facilitating Nilekani’s return to Infosys on 24 August.